Sped up website loading is a feature that we largely improved and is now way more efficient than before. Thanks to loading JS code asynchronously, website loading time has improved. The code is being loaded in an optimized way which results in quick and correct website loading. You can turn this feature on and off in the Settings Panel. 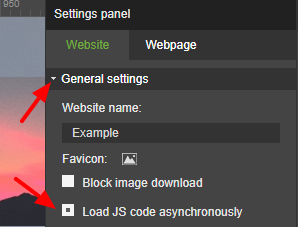 Go to Website, select General Settings and tick a box next to "Load JS code asynchronously". New websites have this functionality turned on by default. Thanks to this feature, newly added text elements in articles will not double content. Before this functionality, after adding a new text element to news layout, the content had been changing in every news created with this template. After the update, the content will change only in the article we currently edit. All you have to do is add to news template a new text element. Now enter any article and change the content of this new element. Changed text will not appear on any other articles. This feature makes displaying the newest images even easier. After adding to Gallery, Slider or Lightbox a new image it will be displayed as the first, not the last. Thanks to the automatic placement of the newest images at the beginning, they will be displayed as first ones, what saves you the trouble of going through all the old images in the element.